7-Zip is an open source program to create and open archives. The program is licensed as free open source and is able to compress files whiles archiving them into a single ZIP, 7Z, GZIP file. The author of this program has created .7z file extensions, recommended to reduce the file size. All popular archivators are able to extract this type of format. 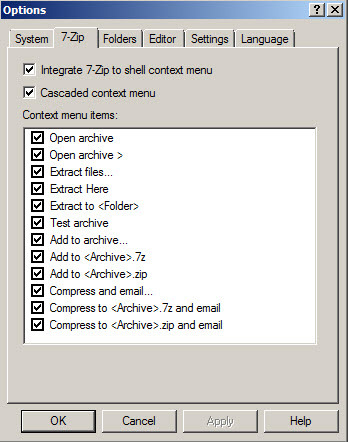 7-Zip allows to choose between different levels of compression (Ultra will reduce the file size at maximum), you can protect the archive with a password, split an archive in multiple ones based on a maximum file size (good to use it if you have file size limitations when you write files on portable devices, send them as attachments by email etc.). The program is integrated into right click menu and you can easily extract files from archives or create new ones. It has an user interface where you can access and change its options such as items that appear in right click menu, associate it as default opener for common types of archives and change the language of interface. 7-Zip can create a few popular formats such as 7Z and ZIP, but is able to extract from a larger number for archive types such as RAR, ZIP, 7Z and more. Conclusion: 7-Zip is not the fastest, but its interface is very straightforward and the program is very easy to use. A big plus because they created .7z file format which is great to reduce the file size. 7-Zip is available as free download for Windows 32-bit and 64-bit. 7-Zip is 100% clean and safe to install. You can see the test results here.